In our last review, we looked at Michael Gorman’s book Cruciformity and saw that for him the defining characteristic of Paul’s experience of God was Spirit-enabled conformity to the crucified and resurrected Christ, a concept he termed “cruciformity.” He also showed that Paul used the the Christ Hymn in Philippians 2:6-11 to help flesh out the shape of this cruciform spirituality. That may well be the case, but while theosis has a rich tradition within the Eastern Church, it’s a term rarely used in Western Christianity and needs some defining. Other relevant scriptural passages include Romans 8:29 “For those God foreknew he also predestined to be conformed to the image of his Son” (NRSV), and 2 Corinthians 3:18 “And all of us, with unveiled faces, seeing the glory of the Lord as though reflected in a mirror, are being transformed into the same image from one degree of glory to another” (NRSV). 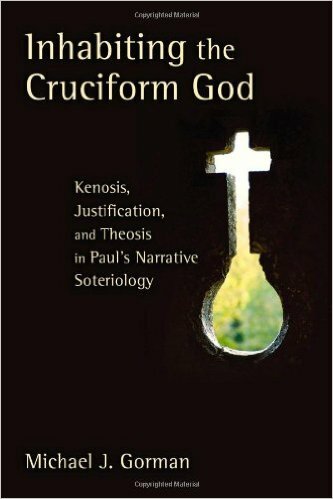 Gorman defines theosis as, “transformative participation in the kenotic [self-emptying], cruciform character of God through Spirit-enabled conformity to the incarnate, crucified, and resurrected/glorified Christ” (p.7). That’s a bit of a mouthful, so in order to better understand what he means, let’s start by looking one last time at the Philippians Christ Hymn. As a protestant theologian, Gorman is treading on hallowed ground here, so he begins by firmly emphasizing that this participatory vision of justification in no way minimizes the need or significance of Christ’s death as the salvific and gracious act of God. Nor does it endorse Pelagian notions of self-justification or justification by “works” since justification by co-crucifixion is impossible without the initiating grace and work of the Holy Spirit (p.40). He frames his discussion around the famous phrase in Romans 5:1 “justified by faith.” In all of this, his intention is to unite together two soteriological models frequently portrayed as being in opposition: the juridicial (justification-by-faith) model and the participationist (dying-and-rising-with-Christ) model (p.45). According to Gorman, justification for Paul is connected with reconciliation and means the “restoration or establishment of right covenantal relations—fidelity to God and love for neighbor—with the certain hope of acquittal/vindication on the day of judgment” (p.53). Putting your faith in Christ and being “crucified” with Him are two sides of the same coin. At the end of this admittedly complicated chapter, Gorman again repeats that a participatory understanding of justification doesn’t marginalize its juridical aspect. “Rather, it says that in Pauline theological forensics, God’s declaration of ‘justified!’ is now a ‘performative utterance,’ an effective word that does not return void but effects transformation” (p.101). Any theological fracture between justification and sanctification is problematic for Gorman because those who have been “crucified with Christ” and “justified by faith” are also those who have been initiated by the grace of God into the ongoing process of cruciformity, which as he reminds readers, is “the process of theoformity, or theosis” (p.45). The next chapter of Inhabiting the Cruciform God examines Paul’s view of holiness. Gorman seeks to show that for Paul the church is both already holy (1 Cor 1:2) and called to be holy. In other words, “Holiness (hagiasmos), for Paul, is both gift and task” (p.108). Believers in Christ participate in the cross-defined life of faith working through love by the transforming power of the indwelling Spirit, which, for Gorman, makes it possible to say that “theosis… is a helpful alternative term (and perhaps even a more appropriate one) for what has usually been called sanctification or holiness in Paul” (p.106). Some readers may worry that Gorman’s participatory vision of justification undercuts the Protestant contention that justification is by “faith alone,” which is a legitimate doctrine worth defending. However, is he actually betraying the Reformation here? I think not. He repeatedly affirms that salvation is only by God’s grace and rejects all notions of Pelagianism or Semi-Pelagianism. What he is doing, though, is striving against the equivalent of what Bonhoeffer calls “cheap grace” in The Cost of Discipleship. As Gorman puts it, “parts of the Christian church have become enamored with cheap justification. Cheap justification is justification without justice, faith without love, declaration without transformation” (p.41). Even if one disagrees with Gorman’s conclusions, it should be admitted that he repeatedly expresses his intention to remain faithful to these important tenants of the Reformation. In conclusion, I think that Gorman has made an important and necessary contribution with Inhabiting the Cruciform God. He has composed a detailed argument that he sees as highlighting an important connection between justification and sanctification in the Western Church and theosis in the East. It’s not that I think areas of legitimate disagreement should be simply papered over, but I firmly support efforts to help reconcile different parts of the body of Christ. Therefore, I find Gorman’s work in this area to be a valuable service and well worth reading. This entry was posted in Book Reviews and tagged Cruciformity, Eastern Orthodoxy, Justification, Michael Gorman, Paul, Reconciliation, Sanctification, Soteriology, theology, Theosis by joecrow91. Bookmark the permalink.